A Legend Departed. His Usurper to the Crown. Wembley Stadium, one of the cathedrals of European football was host to a captivating FA Cup bout that coincidentally brought forth a new era of Everton F.C. Manchester City, who a yr ago to that date captivated the “SACCER” world with perhaps the greatest ending to an EPL season imaginable. The noisy neighbors as Alex Ferguson coined them languished the next yr. Drop offs in form from the likes of Aguerro, Nasri, Toure. In house fighting with Mancini and Tevez that became the EPL’s spinoff of Sammy and Ronnie. Balotelli being Balotelli. It was a poor defense of a title that eventually led to Manchester United usurping the throne in casual fashion. Wigan Athletic didn’t have nearly the publicity but perhaps the same intrigue. Their campaign was saddled with merely staying afloat in the Premier League. With Martinez at the helm, they were a solid passing team who got a tremendous season from Arouna Kone and spurts of wing play from McManaman. 73 goals conceded though ended up being their undoing, tied for last in the Premier League with Reading, another relegated causality from that season. Wigan went down, but not before producing an upset of biblical proportions. City-Wigan ended up being a wonderful game for the neutral and the ending of an era of some sorts. Wigan won off a header from Ben Watson, and McManaman displayed a fearlessness in his runs that made him the one who stood out from that encounter. City and their “too cool for school” approach was a fitting end to the Mancini regime while Martinez left a club with their first trophy in 81 yrs. Mancini was sacked and replaced by Manuel Pellegrini, a man who looks like he has a two pack a day habit while having hair that would compete with Mancini’s any day of the week (and sometimes Sunday). Martinez embarked on a new journey that would see him take over for David Moyes, who kept Everton in a mid-table spot for numerous yrs when it seemed that his transfer budget was akin to the value you would get for trading in jewellery. A living legend left for the greener pastures of Old Trafford while the positivity in Martinez saw a new challenge in Goodison Park, remaking a squad that traditionally favored long balls and strength into a fluid attacking side that more resembled Swansea than Stoke. 11 games into this season and Everton sit tied for 5th in the EPL, 5 points back of the leaders Arsenal. Their squad in many ways is the antithesis of what Everton was under the Moyes era. Attractive on the eye, rotations that don’t settle for draws when the opportunity arises, more emphasis on short passes and attacking third touches. It’s been a remarkable turnaround in such a short time. The loss of Fellani has been mitigated by the resurgence of Gareth Barry and the signing of James McCarthy. Lukaku at times plays like a men amongst boys, Baines has become the best LB in England while they have a myriad of attacking midfielders in Pienaar, Barkley, Deulofeu , Mirallas who all are comfortable playing within Martinez’s offensive ideology. Everton average 453 short passes per game this season, up from 369 last yr. They now average 58.1% possession, up from 52.9% last yr. One thing that hasn’t changed from a season ago is their tendency to use the left side of the pitch. Last yr Everton attacked the left side 42% of the pitch, tied for highest in the EPL with Martinez’s Wigan Athletic side. This yr? 41%. It doesn’t hurt as well that they at this time have the best LB in the EPL (whether they do come the January Transfer Window remains to be seen). He has averaged the most passes per game this yr for Everton at 72.4, the third highest pass completion % at 87% and the second highest KP per game. He’s revived his career under Martinez and if Everton manages a CL spot by season’s end, he’ll be a main reason for it. The Lukaku loan for Everton has been perhaps the steal of the season so far. 5 goals in 7 total appearances so far, the type of production that would be of great use to his parent club in Chelsea. He’s the opposite of Jelavic, who at times resembled a bull in a china shop. His athleticism is noticeable, almost reminding you of a kid who doesn’t at times know his own strength. He’s comfortable on the ball and his 2.3 aerial duels won per game is proof of his ability in the air. He displayed the same type of production last yr, netting 17 goals in 35 total appearances for West Brom under Steve Clark, the 6th highest mark in the EPL. He’s a crucial cog in the success of Everton. Their TSR so far has been solid and could be improved on. Their PDO on the road is the 5th lowest in the EPL yet they’ve managed a solid 9 points in 6 away matches, an average of 1.5 points per game that would be a marketable improvement from last season when they registered 21 points in 19 away matches. 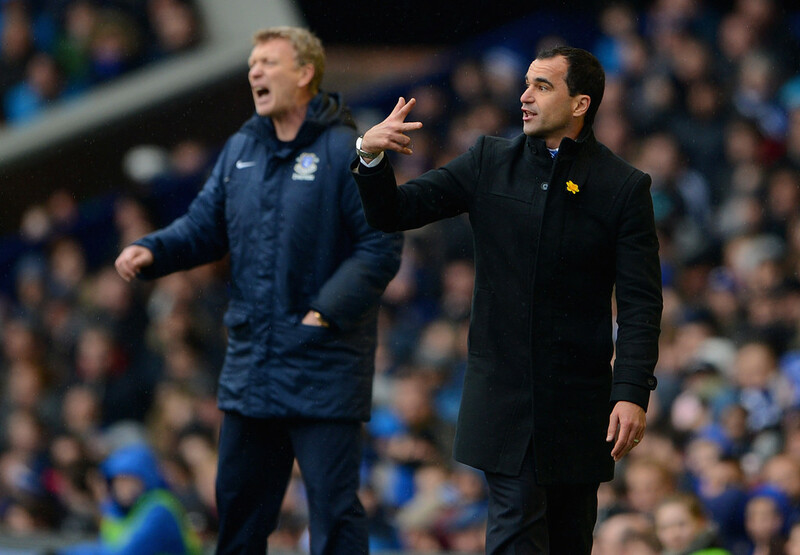 Martinez has set up Everton with a higher level of riskiness that was absent under Moyes. While Moyes showed his content with sitting back and protecting a lead, Martinez is different. It’s not risk-averse, as the City-Everton game proved, but it’s a breath of fresh air in a season that’s been full of it for the Spaniard. Everton are five points away from the crown this season, a season where the unpredictable has become predictable. Everton have remodeled their team on the fly, bringing about excitement and variability that was at times missing in the Moyes era. It hasn’t been a fully seamless transition. Four goalless draws against the likes of Cardiff, Crystal Palace and West Bromwich Albion have denied the Merseyside club a real opportunity at securing first place through 11/38th’s of the Premier League season. Replacing a living legend was always going to be a difficult task for Roberto Martinez, but if there’s anything we can say definitively it’s that through 11/38th’s of the EPL season, Everton F.C. has changed and they can thank Ben Watson for it. This entry was posted in Uncategorized and tagged David Moyes, Everton, Premier League, Roberto Martinez. Bookmark the permalink.